CALGARY, AB--(Marketwired - July 29, 2015) - When you think of the iconic ice covered Arctic landscape, it's hard to believe much of it is actually permafrost-saturated soil, now collapsing due to climate change. Although a less widely known issue than receding sea ice, disintegrating permafrost is threatening some of the most historically significant heritage sites in the Canadian Arctic. University of Calgary archaeology professor Peter Dawson is working to preserve a record of one of the most remote locations on earth ­-- Fort Conger in Quttinirpaaq National Park, Ellesmere Island -- before it vanishes with the melting permafrost on which it sits. "Fort Conger is a very important place of both national and international significance," says Dawson, who's been using a 3D digital scanner to capture the features of the area. "It's received all sorts of heritage awards and designations but it's being affected by climate change. Melting permafrost is causing the surface area to sink and erode and that's damaging the wooden buildings." First established in 1875 by British explorers looking for the North Pole, Fort Conger served as scientific headquarters of the ill-fated Lady Franklin Bay Expedition during the First International Polar Year (1882-83). During the decades that followed, American Polar Explorer Robert Peary also used the site for his controversial quest for the North Pole. All of that may be erased thanks to climate change. The melting permafrost is just one of several looming risks as the Arctic is opening up -- receding sea ice is allowing more adventure tour companies to operate in the region, leading to further damage as passengers wander around the site. "You can get 40 or 50 passengers disembarking at a time and wandering around and it's very difficult to monitor the impact these visitors are having," says Dawson. "They can pick up artifacts or accidentally damage a building." Dawson first scanned Fort Conger in 2010 using a borrowed digital scanner. He's now receiving just over $51,000 from the Canada Foundation for Innovation's (CFI) John R. Evans Leaders Fund (JELF) to purchase his own scanner. Dawson will use his new equipment to continue to record and monitor the site -- every building, rock and artifact. The scanner is about the size of a lunch box and sits on a tripod, rotating 360 degrees and emitting beams of laser light millions of times a minute, measuring how long it takes that beam to strike the surface of a building or artifact and return to the scanner. The result is a highly detailed 3D image of an object or landscape. "Using 3D scanning data to capture the rapidly changing face of these world heritage sites, in the face of natural processes and human activities, offers a way of encapsulating a baseline so that conservation and restoration work can be planned from the resulting 3D models," says Dawson. "The 3D models created from laser scanning data can also be used to excite public interest in cultural stewardship and Arctic history." Dawson's project is one of eight based at the University of Calgary to receive JELF funding totalling nearly $1.5 million announced Wednesday, July 29. JELF funds are awarded to acquire infrastructure to undertake cutting-edge research which can help institutions attract and retain internationally leading researchers working in areas with demonstrated or potential excellence. Dawson's research focus is on understanding the impact of climate change on northern people, a critical grand challenge within the university's Human Dynamics in a Changing World priority. The high-technology historical record of the Fort Conger site based on Dawson's work to date is currently posted on CyArk, an open sourced heritage archive. NOTE: Interviews with Peter Dawson can be arranged between 9 a.m. and noon on Wednesday. 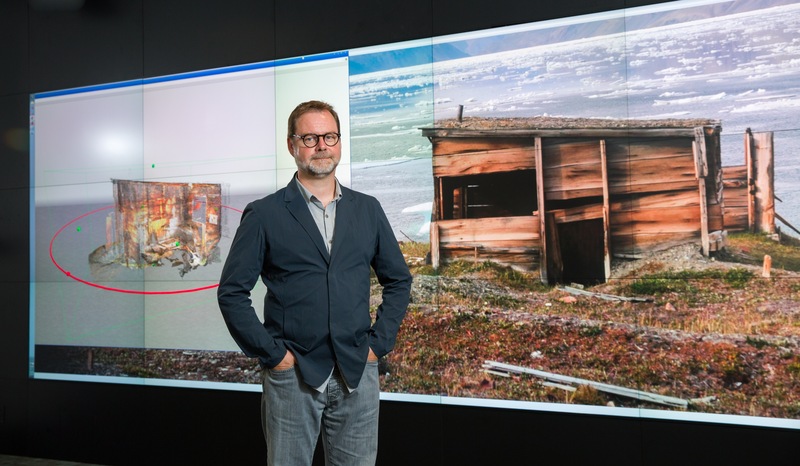 University of Calgary archeology professor Peter Dawson has been awarded funding through the Canada Foundation for Innovation's John R. Evans Fund to continue digitally scanning an important Arctic heritage site on Ellesmere Island in Northern Canada. Fort Conger, built in 1875 by British Explorers, is at risk of collapsing due to melting permafrost caused by climate change. Photo: Riley Brandt, University of Calgary.